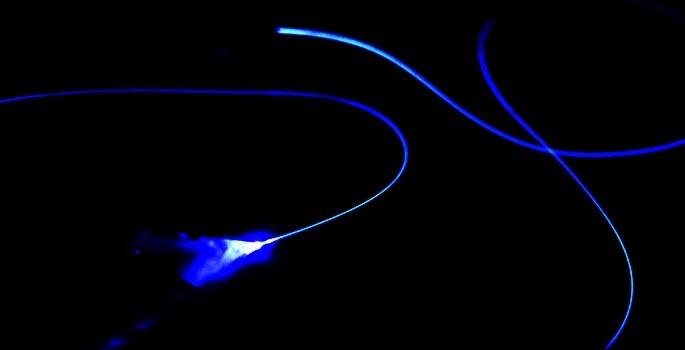 Optical fiber used to reset the circadian clock in mice. ﻿The discovery of a new reset button for the brain's master biological clock could eventually lead to new treatments for conditions like seasonal affective disorder, reduce the adverse health effects of working the night shift and possibly even cure jet lag. The finding is reported in the journal Nature Neuroscience. Until now, neuroscientists had thought that the firing rate of suprachiasmatic nucleus (SCN) neurons was strictly an output of the biological clock's activity. They did not think altering the level of neuronal activity could affect how the clock operates. But the researchers have shown that stimulating and suppressing the SCN's neurons in a fashion that emulates their day and night activity levels can force the clock to reset. The researchers used a new technique called optogenetics to manipulate the firing rate of the SCN neurons. The technique inserts genes that express optically sensitive proteins into target cells in order to make the cells respond to light. The project involved genetically engineering two strains of mice. The neurons in the brain of one strain contained an optically sensitive protein that triggers neuronal activity when exposed to light. The neurons in the brain of the other had a similar protein that suppressed neuronal activity when exposed to light. This exact approach isn't ready for human use yet, but progress is made toward eventually using optogenetics as therapy. This would involve an experimental technique that uses viruses to insert new genes into cells, which is considered a promising potential treatment for a number of diseases. The researchers are currently testing whether strains of mice that suffer from seasonal affective disorder respond to this new approach. Based on material originally posted by Vanderbilt University.